“Miss Julia Rawlings Funeral Rites Today.” Washington Evening Star, 25 March 1950, p. 33. 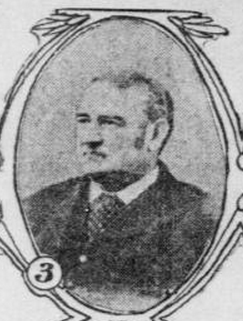 Washington Times, 4 June 1906, p. 12. “Guiteau Juror Is Dead.” Washington Post, 5 June 1906, p. 5. “Henry Jackson Bright, one of the few survivors of the famous Guiteau jury, died yesterday at his home in the Lambert Flats, on A street northeast. Mr. Bright had suffered nearly three years from heart trouble supplemented by bright’s disease and dropsy. “He will be buried to-morrow from his late home. 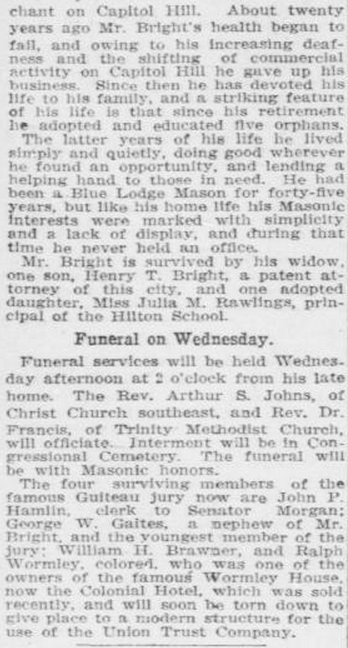 The funeral will be under the auspices of the Masonic lodge, of which he was a member. Burial will be in Congressional Cemetery. “Mr. Bright was seventy-eight years old. He was born near Alexandria, Va., but in his early youth moved to this city. At the age of twenty-one he engaged in the shoe business on what was then known as Capitol Hill, and he continued there till about twenty years ago, when he retired from business. “Died.” Washington Post, 4 June 1906, p. 3. “BRIGHT—On Monday, June 4, 1906, at 1 a.m., Henry Jackson Bright, in the seventy-eighth year of his age. Federal census, 1900, Washington, D.C. (Dist. 126, p. 34). 517 A Street, SE. Henry Bright, head, white, male, b. Feb. 1829, 71, married for 41 years, b. in D.C., parents b. in Va.
Mary E. Bright, wife, white, female, b. Dec. 1835, 64, married for 41 years, mother of 3 children (1 living), b. in D.C., father b. in Va., mother b. in Md. Julia A. Rawlings, niece, white, female, b. Feb. 1864, 30, single, b. in D.C., father b. in Md., mother b. in D.C., public school teacher. A. B. Stoughton [Rawlings], nephew, white, male, b. Aug. 1869, 30, single, b. in D.C., father b. in Md., mother b. in D.C., [no occupation]. Henry T. Bright, son, white, male, b. Sept. 1875, 24, single, b. in D.C., parents b. in D.C., patent attorney.